When humans are infected with the Krippin Virus a common symptom is developing a high fever. We can now detect the applicants with fever, and isolate them before they start infecting others. The medical team is on call to examine them further. If the fever turns out to be a normal fever the applicants will remain isolated until they are healthy, and can then return to their training program. If it turns out to be the Krippin Virus they will not be eligible for travel, and will be removed from the training facilites. This will ensure the well-being and prospering of all our applicants that are free of the Krippin Virus. Detecting fever is achieved through a temperature tracking bracelet. 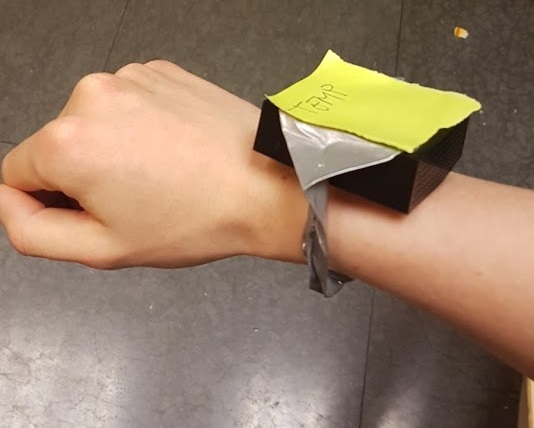 All applicants are handed a bracelet after identity control, and must then keep it on at all time, for the rest of their stay in our facilities. A Nordic Thingy sensor measures temperature, and through a WebHook an IFTTT event is triggered every minute. The event will forward the temperature and userId to our web API in Google Cloud, and the data is stored in Cloud SQL. Having used IoT to help in assist in diagnostics using a wearable device we think we deserve the [Dr. Who] and [Wear me!] badges.